Many media outlets and blogs (including our own), have reported on the results of the Housing Vacancy Survey (HVS) for the fourth quarter of 2014, which showed the US homeownership rate had dropped to its lowest point in fully 20 years. But the fourth quarter HVS contained another surprising reading—one that could be even more noteworthy than the continued fall in the homeownership rate. The HVS is one of very few sources of short-term estimates of household growth – an important gauge of housing demand. 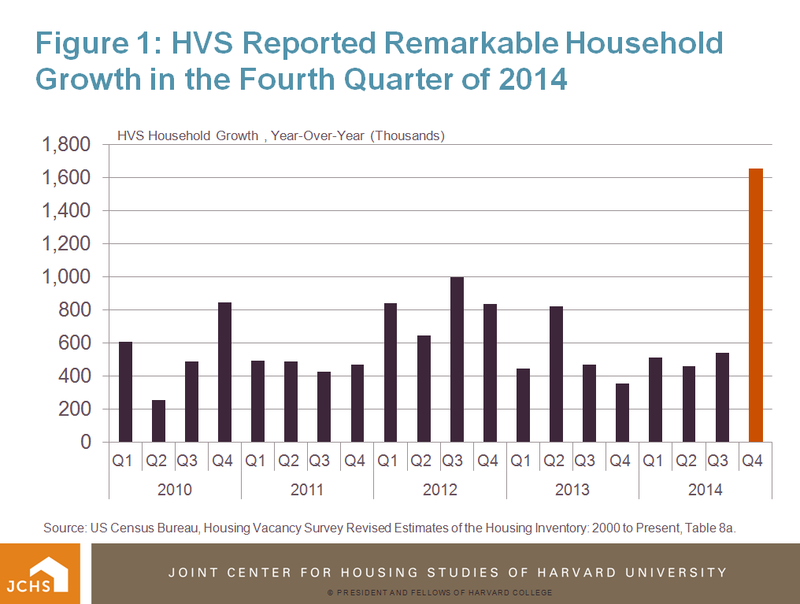 And the surprise here was that HVS data show household growth going through the roof in the fourth quarter of 2014, with year-over-year growth in excess of 1.6 million households. This comes after household growth had long been stalled out, averaging less than 600,000 per quarter for much of the previous five years (Figure 1). The concern and attention surrounding this number breeds from the thick cloud of uncertainty behind trends in household growth. Survey data from the Census Bureau such as the HVS, ACS, and CPS/ASEC give different and sometimes conflicting measures of household growth year-to-year, each with wide margins of error, which makes it difficult for analysts to call out trends with much confidence. Amidst this lack of clarity is a widely held anticipation, or possibly hope, that household growth, having been ‘pent-up’ after such a long period of weakness, is primed to rebound strongly and this Q4 number from HVS might signal an inflection point. Source: US Census Bureau, Housing Vacancy Survey Revised Estimates of the Housing Inventory: 2000 to Present, Table 8a. One possible explanation for such an abrupt change in the rate of household growth in the fourth quarter HVS would be some change in how the survey is conducted or weighted that caused a discontinuity in the series. But the folks at HVS report that there were no structural or methodological changes to the dataset that would have been behind the sharp rise. Without any methodological justification for the sudden jump, another factor may be some degree of sampling variation that produced an abnormally high estimate for the quarter. HVS has noted that quarter to quarter variability within the survey has increased and in many respects, this Q4 number is simply a prime example of how erratic quarterly data in the HVS can be and why we prefer not to make much of any one quarter and opt instead to look at rolling averages or other smoothed versions of this data to get a sense of recent trends. 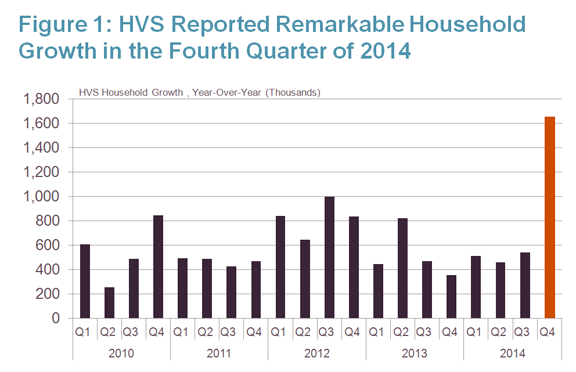 But even averaged over the previous four quarters, Q4 still pulls the annual household growth reading for 2014 up significantly, to 789,000, representing a significant increase from the 524,000 annual growth reported for 2013, although still well below the long-run pace of 1.2 million per year that the Joint Center estimates is the baseline amount to expect given current levels of adult population growth and changes. Alternatively, this fourth quarter increase could be a sign that the HVS is simply catching up to reality with its household counts after underestimating household growth over the past several years, In fact, prior to the 4th quarter results, the primary concern with HVS estimates was that they were overly low (see previous blogs on the topic here and here), in showing continued weakness in new household formation even as the economic recovery continued to gain steam. Indeed, there are a variety of other market indicators that would suggest that household growth has been increasing at a modest pace in recent years and more than has been suggested in HVS quarterly releases prior to Q4. Most notably, employment growth has been ratcheting up over the last three years, from 2.3 million in 2012 to 2.4 million in 2013 and 3.1 million last year. Importantly, these gains have also been felt among young adults who are so important to household formation, with the unemployment rate of those age 25-34 dropping from 8.9 to 5.9 percent over this period. The slow rise in housing starts from 550,000 in 2009 to 1.0 million last year, at the same time that vacancy rates have declined, also suggests that household growth has been picking up steadily over this period. In short, given the nature of survey data, we are not putting too much trust in the accuracy of this one quarter’s estimate of household growth reaching a 1.6 million annual pace, but do believe household formation has been gaining momentum, which bodes well for a stronger housing recovery in 2015. But there are also headwinds. Indeed, rising rents, declining rental affordability, and rising student debt levels remain barriers to household formation for many. Given the lack of clarity, certainly there is good reason to keep an even closer eye on this important measure over the course of the coming year.